[Kick-Off] The Month of the Silvers starts now! It’s here! Today is the release day of the paperback edition of The Flight of the Silver with its shiny new cover and that means it’s also the start of The Month of the Silvers! We have some posts planned for the next couple of weeks, including an interview with Daniel Price, a read-along, a book-related game and more. 01/10/15: Last day to enter the game! 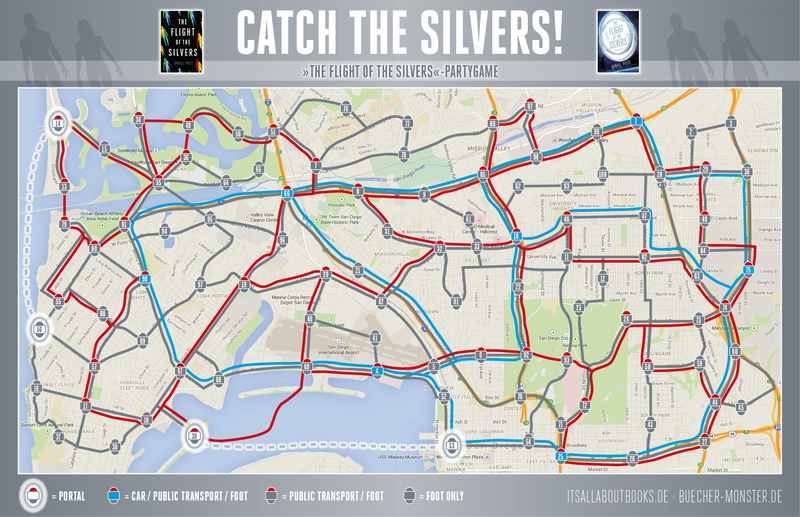 Inspired by the bookish games over at Oh, the books, we decided to adapt a board game for The Month of the Silvers. Everyone can play, it doesn’t matter if you’ve read the book or not! Even though we designed this game to match the book, it won’t be necessary to know/remember anything about the story but you also won’t be spoiled in case you still want to read it. The game we chose is Scotland Yard. This as a pursuit-evasion game, where one player (Mister X) is chased by detectives of Scotland Yard. In our game, it’s not the bad guy though who is chased, but the Silvers! In the book, the Silvers are up against different opponents. They travel across the country, trying to hide and not to be found by any of these groups. It’s also not set in London, like the original game, but we chose San Diego because it’s a place the Silvers actually visit in the book. We will assign each participant to one of four groups: the Silvers or one of the three opponent groups. The three opponent groups each want to catch the Silvers and can work together if they want BUT only one group can win. Each group will get a location on the map (that replaces the usual board). The location of the Silvers will be kept secret, the others are known to everyone. Once a group decides on a method of transportation for their move, they loose a token for that method. The Silvers have an infinite supply of these tokens, because they get the used ones of the other groups. According to the map, you can’t use every method of transport from every location and some methods bring you further than others. The Silvers don’t have to tell where they are going next but they have to reveal what method of transport they use. Every group has to make one move every round (there will be one round every two days). To keep the Silvers‘ location secret, they will get a private forum where they can discuss their next move. The opponents can discuss their moves in the open one that everyone can access. To be able to find the Silvers, they have to reveal their position every 5 moves, starting from the 3rd. Spectral image: If it’s one of the rounds where they have to reveal themselves, they can decide to not make a move and instead mislead their opponents by revealing a different location (that is inside a radius of 2 moves of their actual location). They could also use this but still decide to tell their real location to cause confusion. Portal: To go through a portal means they don’t actually reveal what method of transportation they used. It can also be used in a few rare locations to move to other far away locations. Tempic road block: instead of making a move, the Silvers can block a single road during one move. This can be especially useful when it looks like they might get caught during the next one. 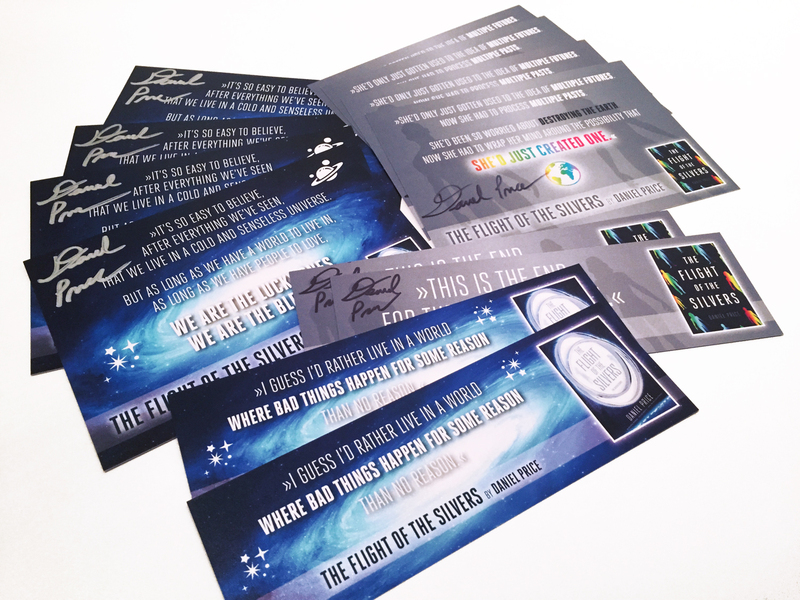 Every member of the winning group will get signed Silvers swag (see below)! Want to play the game? Enter until 01/10/15 with a comment stating that you want to play and you are in! You will get your role in the game in an email on January 11th. [Ankündigung & Gewinnspiel] The Month of the Silvers! Total super, dass ihr euch solche Mühe gebt.